This page includes President's Message columns from the 2000 issues of Across the Fence Post. Greetings from your new president, and a special wish for a happy new year as our federation steps into the new century. A hearty round of applause is in order for your club officers who have just completed another year of service, and especially to Greg Schmidt as our leader. We also welcome Art Schmitz and Vern Witt who begin terms as new regional VPs. It is not too early to start planning to attend WISCOPEX 2000, which will be held in Madison. The year 2001 will find WISCOPEX in Sheboygan, but after that the calendar is blank. We need host clubs for the years 2002, 2003, and 2004. Bids (offers) will be accepted at our next Annual Business Meeting, scheduled for April 29, 2000. This is the time, therefore, to start planning for your club to host what has always been one of the better shows in our state. Feel free to contact WFSC Secretary Karen Weigt or me if you need more information. Besides our hobby activities, the first few months of any year find us working on state and federal income tax returns. At the same time, we often are preparing estate and planned giving documents. Your federation, as an IRS 501(c)(3) qualified organization, can be part of any tax-saving plans that apply to you. Your stamp or postal history collections can be given to the WFSC. Of course, assets like cash, life insurance proceeds, stock and bonds also can be transferred. We are always ready to work with attorneys or accountants in advance when detailed preplanning is necessary. One small item is to suggest that you use our legal name, "Wisconsin Federation of Stamp Clubs, Inc.," in any legal documents. Whatever you do, don't leave a spouse or other family member in the dark about your collection. Be it of great or more modest value, someone has to be aware of your collection, its location and potential value. Maybe like you, I've been asked to look at collections of recently deceased collectors. This is when I find myself trying to explain to non-collecting family members that most common U.S. mint stamps issued from the mid-1930s to now have gained little in value, and in many cases they are worth only 80 percent of face value. As a more advanced collector, I hope you are working with family and advisors on the disposition you plan for your collection. The WFSC Bylaws require that every new president must either reinstate or change existing presidential appointments within 60 days of taking office. An exception are those appointments that are made at WISCOPEX. Corporate Registered Agent: Karen Weigt - Ensure that annual WFSC incorpora-tion reports are filed. Finance Committee: Chrmn. Deanna Juhnke, Jim Maher, Fred Ziemann - Maintain inventory control, prepare annual budgets, review project and newsletter budgets, and make financial recommendations to the WFSC Executive Board. Publicity and Public Relations Commit-tee: co-Chrmn. MaryAnn Bowman and Karen Weigt - Promote a positive and up-front image of the WFSC through a variety of means. Judging Committee: Chrmn. Frank Moertl, Jim Maher, Vern Witt - Maintain a listing of WFSC judges and apprentices, provide judges and judging guidelines for local WFSC member-club shows, recruit and train new judges, and provide awards criteria and current judging sheets. Wisconsin Stamp Suggestion Commit-tee: (vacant) - When deemed necessary, prepare letters of opinion to the U.S. Postal Service, research potential Wisconsin-related stamp subjects, submit correspondence to various officials (including the Citizens' Stamp Advisory Committee) to promote Wisconsin-related U.S. Postal Service issues. Bylaws Committee: Chrmn. Karen Weigt, Raymond J. Wood - Periodically review existing bylaws and standing rules, recommend amendments to reflect changing times and functions of the WFSC, and consider suggested amendments made by others. Awards Chairman: John Fagan (This new position was created at the October 2, 1999, WFSC Executive Board meeting.) - Maintain awards inventory, prepare awards and ensure that they are properly distributed. Committee on Exhibitions: Chrmn. Robert J. Mather, Claude Giralte, A1 Marcus - Serve as counsel to WISCOPEX host clubs and periodically review and update the Rules for Annual Exhibitions (BLUE BOOK). Nominating Committee: Chrmn. Vern Witt, Roy Northwood, Greg Schmidt - Canvas WFSC clubs for qualified candidates for the offices of president, VP, secretary, and treasurer. Hall of Fame Committee: Chrmn. Jim Maher, Perry Harris, Frank Moertl - Publicize the WFSC Wisconsin Philatelic Hall of Fame, seek and screen nominations, and ensure that Hall of Fame functions and formal inductions are handled in an orderly and respectable fashion. Permanent Record Book: Frank Moertl - House and keep the book up to date. Historian: Verna Shackleton - Gather and maintain the historica7 files and WFSC memorabilia. Ad Managers: Jim and Renee Seiler - Solicit ads and handle associated monetary matters. Committee: Chrmn. Karen Weigt, MaryAnn Bowman, A1 Marcus - Set guide-lines for the editor, both present and future, and serve as counsel to the editor. BLUE BOOK: Greg Schmidt - Prepare updated WFSC BLUE BOOK pages as needed and distribute the pages to WFSC club del-egates at WISCOPEX. Wisconsin on Stamps, 2nd Edition Editor: Karen Weigt - Produce the publication. Publications Committee: Chrmn. Deanna Juhnke, MaryAnn Bowman, Jim Maher, Greg Schmidt - Serve as counsel to the editor. Cover Exchange Program: MaryAnn Bowman - Publicize the annual program and handle exchanges. Show/Bourse/Meeting Info Flier: Karen Weigt - Gather information and produce the annual flier. The WFSC will elect or re-elect nine officers at its WISCOPEX 2000 Annual Business Meeting, scheduled for 1 p.m. an April 29. The following job descriptions briefly outline what each position involves, and I hope you just might be motivated to consider running for one of these offices. We turned the calendar over from the 1900s to the 2000s. Then we made it through the Y2K bugs and even past the February 29th bugs. This means it is my happy job to officially call you to attend the 69th convention of the Wisconsin Federation of Stamp Clubs. We will gather at the Madison Turners Hall, 3001 So. Stoughton Rd., Madison, on April 29-30. W'ISCOPEX 2000 is hosted by the Badger Stamp Club under the direction of Gen. Chrmn. Dan Undersander and Asst. Chrmn. Karen Weigt. Charles Shoemaker has coordinated the exhibits portion of the show. Every WFSC club is reminded to send a delegate and/or alternate to the Annual Business. Meeting, which is scheduled for Saturday, April 29, at 1 p.m. Delegate check-in should be completed before the meeting is called to order. You can preregister at the WFSC table at any time Saturday morning. All that's needed are written credentials, a simple statement signed by your club president designating you as the official representative of your club. All club members and members-at-large are encouraged to attend, understanding only official delegates have voting privileges. Our business meeting, a once-a-year event, can run up to 90 minutes, but we get a lot of work done in a short time. The meeting includes officer, committee, and special project reports. As was noted in the March ATFP, important elections are being held for the offices of secretary and treasurer this year, plus a VP Youth Division and six regional VPs. A tradition at the close of the meeting is to recognize our deceased members with a moment of silence. Delegates, please be prepared with a WRITTEN list of your club members who have passed away within the last year. Present the list to our WFSC Secretary so those names can be accurately recorded in the minutes. All are encouraged to check in at the WFSC society table upon arriving at the show. Light up your home club on the display map and register for door prizes. Show your WFSC logo button and receive a free gift. While at the society table, offer to relieve the staff now and then or to help out in some other manner. Banquet details and a reservation form were published in the March ATFP. Highlights of the activity include the honoring of one outstanding Wisconsin philatelist as the newest member of the Wisconsin Philatelic Hall of Fame. The 2000 WFSC Dealer Recognition Award and special exhibit awards also will be presented. And, for the second year, the winner of the WISCOPEX Club Award will be announced. This year's youth activities will be especially extensive with a busload of youngsters joining us from the Milwaukee area. WISCOPEX 2000 is offering six tables of hands-on activities for youths with gifts and prizes galore! On April 29, youths additionally can participate in stamp bingo games, guided tours of the bourse, the honoring of youth exhibitors at the Annual Business Meeting, and an afternoon cookies and punch party. Over 50 frames worth of exhibits will vie for awards in the adult open, youth, single-frame, display class, and Champion of Champions competitions. Judges are Bernard A. Hennig, Frank Moertl, Vern Witt, and apprentice Robert Henak. With 19 dealers, the bourse will offer something for everyone. The U.S. Postal Service will have all the latest new issues and a special show cancel. • A display of a real C3a - Inverted Jenny. • Award-winning carver Richard Byrne will display his carvings of classic U.S. postage stamps and demonstrate his craft. • A Bill Robinson auction on Sunday afternoon. This is not a book review. My copy of Linn's World Stamp Almanac has not yet arrived here in Oshkosh, but I'm so confident it will be bigger and better than the last edition that I want to recommend it to you, sight unseen. The 2000 millennium version is 1,064 pages and covers subjects like the history of posts, the U.S. Postal Service, U.S. postage stamps, stamp production, selected domestic postal rates (historic and current), and duck stamps. The second half includes topics such as law and philately, worldwide postal agencies, collecting basics, U.S. and foreign stamp organizations, exhibiting, dealer organizations, and museums and libraries. This is the type of book the seasoned collector will pick up for quick-reference use; the starting collector can use it to get answers to questions. The Oshkosh Philatelic Society has offered to buy copies for the two largest public libraries in its backyard. My 1989 copy of the Almanac has gotten a workout. Somehow I think this will happen to the 2000 edition, too. WISCOPEX is unlike many stamp shows in that its host club and location differ from year to year. Its main features, though, are constant and include exhibits, a dealer bourse, and the WFSC Annual Business Meeting. Hats off to the Badger Stamp Club as this year's host. All of its behind-the-scenes efforts paid off with a well-attended two-day event. If you missed it, do plan on being with us in Sheboygan for WISCOPEX 2001. I was told after the 2000 Annual Business Meeting that it was one of the shorter such sessions in recent years, but we covered the full agenda and even had a few minutes for some special activities. We started the meeting with a welcome to the many youth exhibitors who were present. Something we don't do on a regular basis also took place - we welcomed the Rockford Jim Johnson (l.), of Wisconsin Valley Stamps, Rothsehild, Wl, receives award certificate, from WFSC President Paul T. Schroeder. (IL) Stamp Club back into the WFSC and later in the meeting accepted the club's invitation to host our 2002 convention and exhibition. As WFSC president, I was honored to announce the induction of Fr. David Christel to the Wisconsin Philatelic Hall of Fame Class of 2000. The other banquet presentation was the WFSC Dealer Recognition Award, which went to James R. Johnson of Wisconsin Valley Stamps. Depending on how you read the calendar, we either had the first successful show of the new century or closed out the last century with a hang. The boundaries of the state of Wisconsin have been fixed since 1848, but the counties within have changed many times as populations shifted. For many years, the WFSC has had a stable set of district boundaries for its regional VPs. Some changes, however, were made at the June 10, 2000, Executive Board meeting. The approved changes came about as a result of Regional VP Vern Witt's efforts in securing nominees for our regional VP offices. It is my hope that this new arrangement will allow more individuals to ran and serve. • The Belle City Stamp Club (Racine) and the Kenosha Stamp and Cover Club were moved to the Milwaukee region. • The Milwaukee region was renamed Southeast region. • The old Southeast region was renamed South Central region after the loss of the Belle City and Kenosha clubs. No part of these voted changes, but new to our map, is the Rockford (IL) Stamp Club, which was assigned to the Southwest region where it had been in earlier years. These changes are now in effect. My thanks to all who worked on this district realignment. As much as we think we have planned our lives, this month's words were not predetermined but come as a result of the unexpected death of Raymond J. Wood, of Racine. Our condolence is expressed to Ray's family and philatelic friends. Ray served as our VP for the Southeast region (recently renamed South Central region) since 1992 and was re-elected for another term at our last Annual Business Meeting. For more information about Ray's contribution to philately, please see the closed albums that appear elsewhere on this page. Ray's death opens his position for an Executive Board appointment for the term Ending December 31, 2001. Our regional VPs are special people as they are the contact point between local clubs and the WFSC. We ask them to visit each club in their areas once a year if at all possible. They bring matters to the attention of the Executive Board and solicit nonmember clubs to join us. This type of position is ideal for becoming involved in the WFSC. Please contact me if you are willing, able and interested. Once again we bow our heads and remember Ray Wood. We also recognize Mary Ann Sarsfield Koerner who dedicated many years of service to the WFSC. A group of 15 WFSC officers, committee members, appointees, and a few interested parties (always welcome) participated in our fall meeting held at the Olympic Restaurant in Stevens Point. Following our usual timetable, the meeting began at 10 a.m. and adjourned at approximately 3 p.m., with a one-hour break for lunch. Of major consideration were proposals for two amendments to our bylaws. One amendment adds a second VP to the Southeast region, which encompasses 10 clubs. The other revision changes the date of when newly elected officers assume their duties. Both proposals will be formally announced in the February 2001 issue of ATFP. It is my pleasure to wish you Seasons Greetings! This year, my to-me from-me Christmas present was acquired while attending MILCOPEX 2000. In 1978, I was alerted to the story of Alberta Goff, and I've been looking for this Oshkosh artist's World War II patriotic covers ever since. Prior to MILCOPEX, I had one solid and several questionable examples in my collection. The questionable covers are due to Goff's admission that she did not sign all of her works. A new MILCOPEX dealer, Mark Sutton of Cannel, IN, usually deals in American flags and had two tables of patriotic covers on display. Mark said he wasn't familiar with the Goff name. Upon checking his reference materials and stock, however, he found about 20 different Goff designs. Alberta Goff's husband, Chuck, was a military serviceman in New Guinea in 1942. 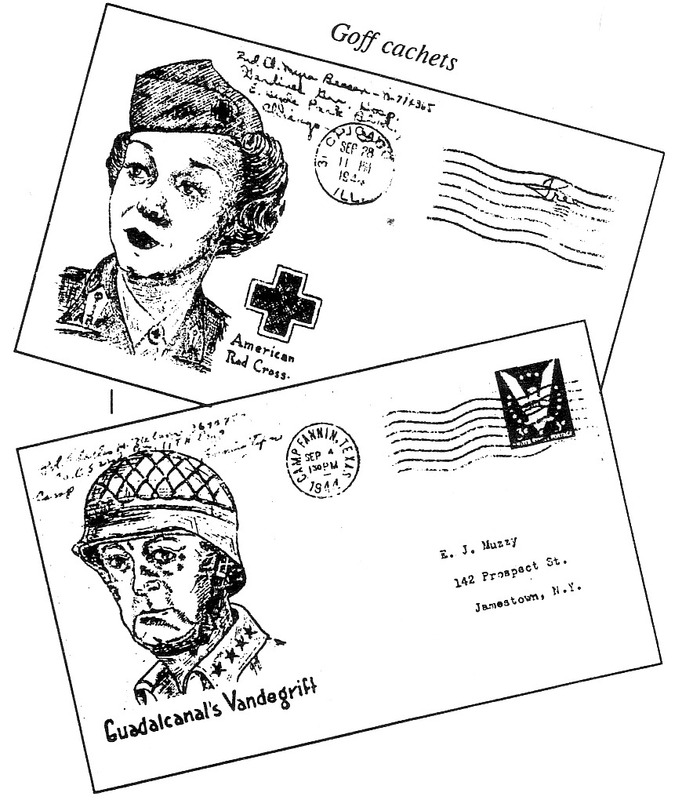 She was a college student in Evanston, IL, at the time and bought wartime slogan and military-decorated envelopes for her personal use. Her purchases were made at a stationery store operated by M. J. Huss, who had lost his artist and was seeking a replacement. Alberta volunteered a few sample drawings and was accepted for the artist position. She was paid $2 for each design and a supply of the finished envelopes. Her designs include some of our well-known leaders, but I prefer those of the rank-and-file GIs, the enlisted men and women of the Corps of Engineers, the Quartermaster Corps, radio technicians, Women's Army Corps, and American Red Cross volunteers.